Here is a beginner exercise ball workout to get you started. 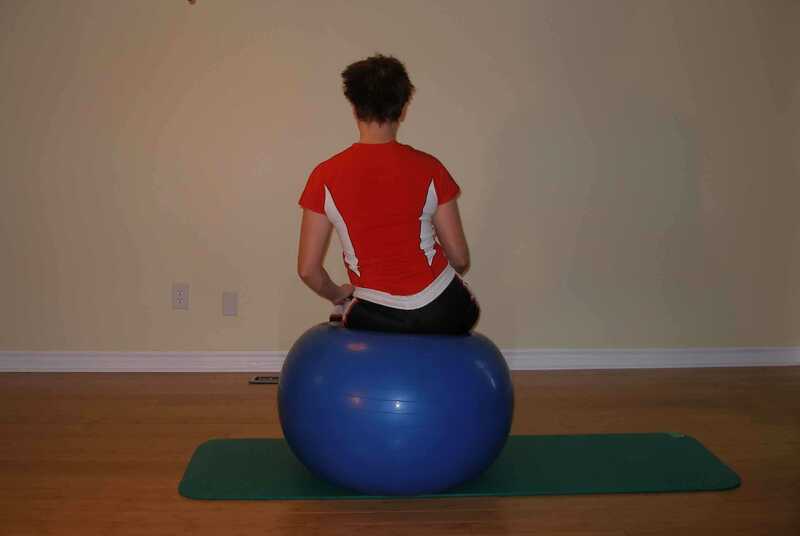 Review all exercise ball instructions and precautions and should you feel any pain or discomfort, stop and consult your physical therapist or physician. Make some space, remove all pointy objects and furniture and prepare to work. Remember it's all about control, not speed, and not brute strength. This exercise ball routine includes exercises for the beginner. If, however you are finding these difficult, go back to the basics. Feel free to modify each program to suit your training needs, and it helps to change your exercising program every 6-8 weeks in order to maximize training progression. Before starting a strength training routine it is prudent to warm up prior and stretch afterward. You can follow the stretching program I've laid out or follow your own depending on your specific needs. I've got more stretches here. A beginner's exercise to get you used to balancing on the exercise ball with only two points of contact. One of the most basic skills required to master exercise ball exercises is being able to separate pelvic movement from lower back movement. 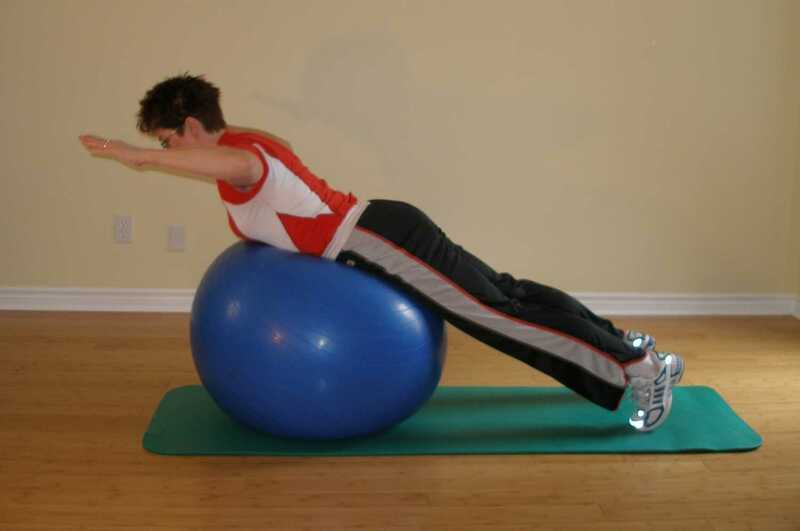 This exercise encourages you to move your pelvis independent of your back. This is a good hamstring exercise that teaches you how to maintain spinal neutrality while your legs are under load. I know this looks simple. I challenge you to do this while not moving your lower back. This is a good lumbar extensor strengthening exercise manageable for the beginner with the tips I've included. Gluteal muscles and back extensors work together functionally in many everyday tasks. Starting with short movements you can recruit your abdominal musculature within your tolerance. Hip abduction is the outward movement of your hips. This movement is accomplished through contraction of the muscles that make up your outer thigh and glutes. Adduction is movement of your thigh toward and across the midline. Contraction of the muscles of the inner thigh lift the leg up against gravity in this exercise. This is a good beginner abdominal crunch to target obliques. By reaching with your arms forward you make this abdominal crunch relatively easy. Most beginner exercise ball workouts include crunches - so here they are. Another basic crunch. People are always doing crunches on the exercise ball. Click on the picture for a full description. A great elementary exercise to work glutes, quads and back extensors together. That is often how they work functionally, so if one is weak it can often lead to problems down the chain. 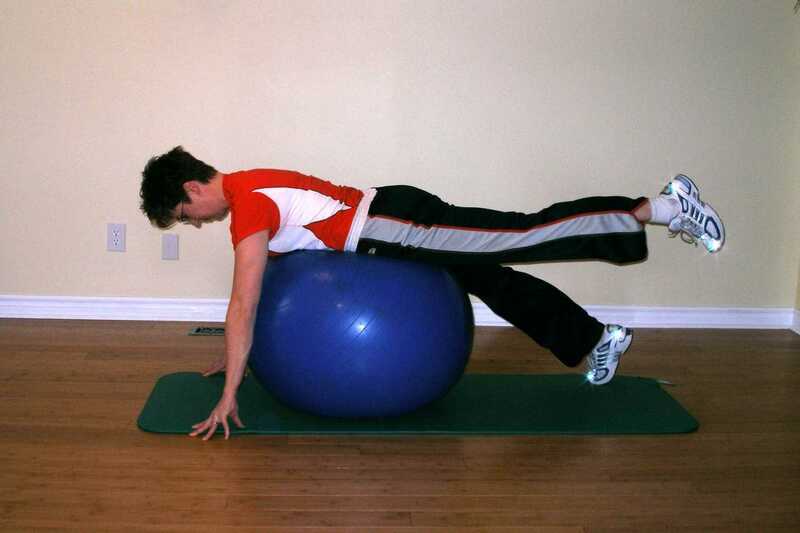 This exercise is important in any beginner exercise ball workout. Always check that your ball is in good condition. Weakness in the rubber can result from exposure to excessive heat or sharp objects. Wear comfortable clothing as well as a good pair of rubber soled shoes for gripping the floor. If you sweat a lot you'd be wise to wear a shirt so you don't slip off the ball. Make sure the area you are working out in is large enough to accommodate the ball and yourself. 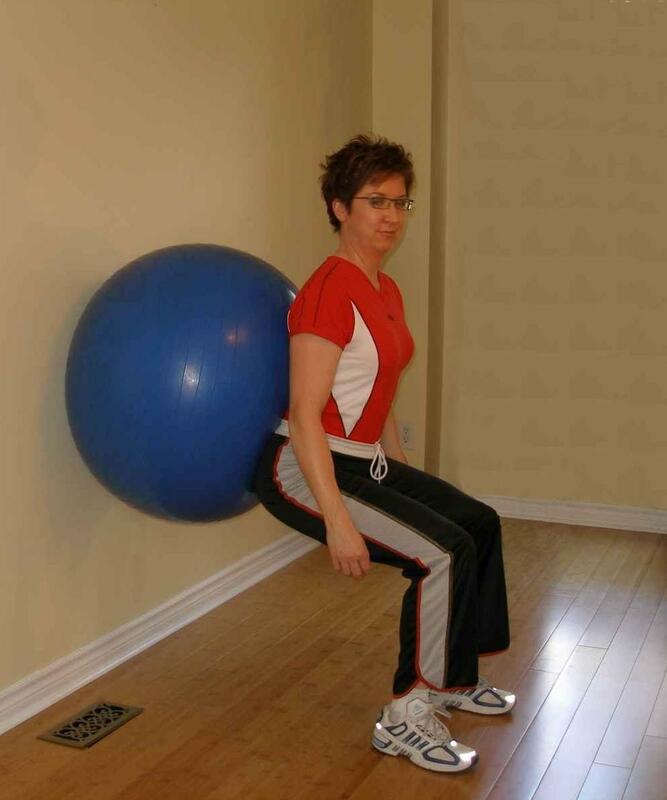 if you are having difficulty balancing on the ball either start with a more rudimentary exercise or prop the ball up against the wall until you get a feel for the movement. If you do not feel comfortable doing an exercise, find an alternative.